← Happy Year of Snake ! 蛇我其誰 ! English translated by Ekaterina! Many Many Thanks!!! Two-time RG Olympic champion – Evgenia Kanaeva has been frequenting Kazan lately. 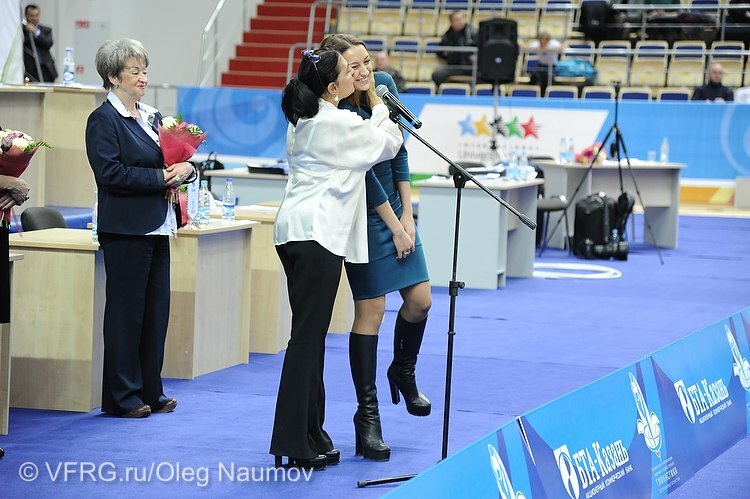 Last fall, she came to Russian Group Championships as an Universiade Ambassador . 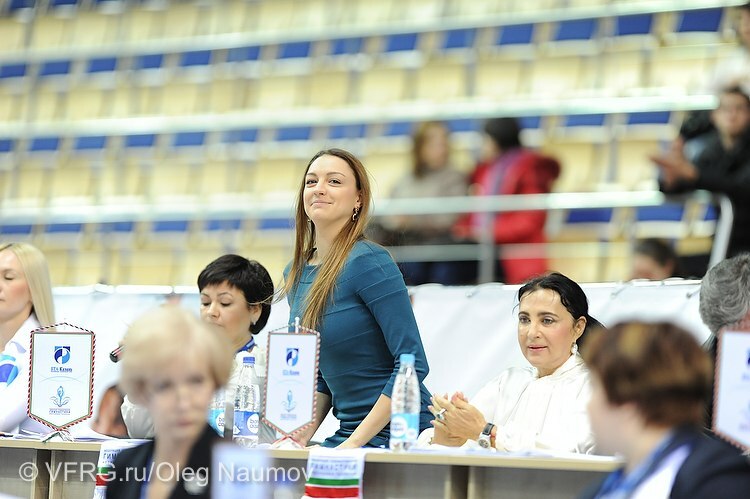 This time her visit was related to Russian championships among juniors, and Kanaeva was present as a newly appointed Russian RG Federation Vice-President. – Evgenia, allow me to ask some questions to you as the record-holder for total victories in International Summer Universiades. You won in Belgrade (2009, five gold medals) and Shenzhen (2011, four gold and one silver medals). But you went to Belgrade already as an Olympic champion. Did not you perceive that competition as a step back in some sense? – Why a step back? Universiade is a very serious and responsible event. If I have competed and won at Olympic Games, it does not mean that I should no longer compete anywhere else. Olympic gold did not prevent me from competing in Russian championships as well; however, there I performed outside of the competition. As for the Universiade, I consider it mini-Olympics. In some way, such integrated competitions help get to know athletes from other sports; there is some sort of a uniting force about it. I greatly enjoyed competing and was very happy when all members of the national team cheered me on. – Did you feel any difference between competitions held in Serbia versus those in China? – China is China. They had done a colossal job in preparation for the big-scale competitions. Both the Olympic Games in Beijing, and Universiade in Shenzhen were held at the highest organizational level. Honestly speaking, I could see a lot of similarities in the organizational details between the Olympics and Universiade. I liked the fact that the Chinese are passionate about what they do. They create a stir before competitions. The spectators came in vast numbers, and that is taking into account, that the competition halls were enormous in China. And all happening there felt grand-scale. As for Serbia, I remember that there were not so many spectators at our competition. Though the locals treated us and everyone who was competing very warmly. By the way, London Olympics were inferior to the ones in Beijing from the point of view of organization; however, naturally I greatly enjoyed competing in England’s capital. But there we were living separately from everybody else: they had placed us in the Olympic village, and it seemed like Rhythmic Gymnastics was having some sort of special competitions. – Some kind of competitions in beauty and grace held separately from all others? – Yes. Olympic Games of beauty and grace, and huge nerves that we were spending (laughing). – The only “silver” from a Universiade you had in Shenzhen. – Yes, there I made a mistake in my ribbon exercise. – When someone mentions a mistake with a ribbon, Irina Tchashina’s accident with a ribbon in Athens, when her ribbon was blown away by the air conditioner, immediately comes to mind. Did you ever experience anything of the kind? – No, no, one cannot compare our silver medals. I made my own mistake in an element, which turned out to be very costly, whereas Dasha Dmitrieva did a clean job with her routine and honorably won. – At the Universiade, RG athletes compete for 5 sets of medals in individual exercises. At the Olympics – only one. To help the situation, I believe, there is still room for winning gold by Russian Olympians. – I believe, in order to increase our competitiveness in the world, it is necessary to pay close attention to all sports and all our athletes. Coaches too, it is also important. Besides, I think, it is necessary to pay close attention to development of each and every sport, try and improve its infrastructure, build sporting objects, such as your center of gymnastics, for example. In addition, support is necessary to hold practice in a country where a particular sport can better develop. This all is necessary so that our athletes would strive to compete with leading athletes and learn by their example. – Are there many gymnastics centers, similar to the one in Kazan, in Russia? – Now they have started building sport complexes. For instance, they have constructed a nice gym in my hometown Omsk. Novogorsk has wonderful conditions for training. I have been living and training there since I was 11, and they have always strived to provide best possible conditions for us. This is very good for young athletes, judging by my experience. You spend entire days in the gym, and if something bothers you, it really starts to depress you. And when everything is good, you do your best to show up for training even on weekends. For instance, I did. – Your hometown Omsk, I believe, is Mecca for RG: Galina Shugurova, Irina Tchashina, you – are all Omsk natives. It seems that in your hometown, all beauties get into RG from birth, and boys become hockey “hawks”. – You know, I am not going to speak for everyone, but it won’t do to call our sport – a sport for beauties. Every person has their own beauty. It won’t do to cut off those who are willing to train like that. As for Omsk, it is true, since a long time ago, a wonderful school of rhythmic gymnastics has emerged there. The reason is that great coaches are working in Omsk. Maybe even since Shugurova’s time. – Russian RG Federation President Irina Viner-Usmanova mentioned that you also have Tatar roots. – (laughing) Irina Aleksandrovna strives to find Tatar roots in every gymnast. I don’t know, it is fully possible that I have them; I just want to say that I have quite a mixed blood. – By the way, did you compete in 2005 when Russian championships were taking place in Kazan? – Yes, I did (smiling). It was my first experience competing at a national championship as an adult, after I had got the right to compete among Masters of Sports. I managed to get into top 8 then, which is why I remember that competition. – Are you planning to attend Kazan Universiade in the summer? – Hope I’ll be able to make it. – Could you announce the list of participants as a vice-president of the national federation? – There are still five more months before the competition, and everything changes fast in our sport. Injuries can also introduce changes, unfortunately. – What do you think about Tatar team in group competitions, which was second at Russian championships last fall? – It is a very good team, very talented girls make it. I know very well sister Elena and Olga Romanchenko: we grew up and competed together. The team has an honorable coach Valentina Ivanitskaya as well as fantastic director and choreographer.